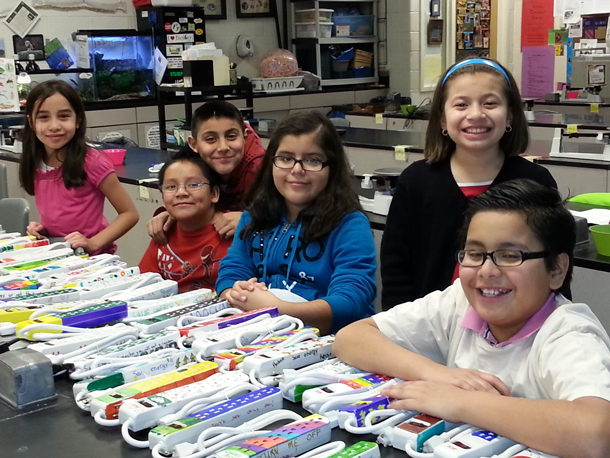 Students from Little Village's Emiliano Zapata Academy with power strips they distributed to classrooms to reduce their energy waste. 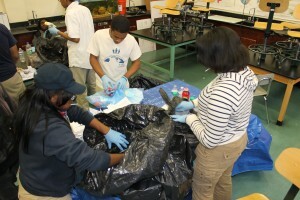 North Lawndale College Prep students conduct a waste audit. The White House Council on Environmental Quality honored 12 teachers with a Presidential Award for environmental education Tuesday, but in Chicago a band of green-minded volunteers added more than 700 new students and teachers to an environmental organization present in every one of the city&apos;s 50 wards. The Chicago Conservation Corps&apos; student program has graduated roughly 6,500 students and teachers who have devoted some 150,000 hours of service since the program begin in 2006. Partner organizations can team up with the group for environmental service projects, drawing on volunteers from the general public as well as adults who have undergone environmental leadership training. The program comes with some ready-made projects, like making household cleaning products from non-toxic ingredients and distributing home weatherization kits to promote energy efficiency. New clubs start by auditing their trash, food waste and leaky faucets — their leak-finding program reportedly saved 1.5 million gallons last year. But many schools develop their own curricula. Students at North Lawndale College Prep, for example, filmed a video about the dangers of radon poisoning. John Hancock High School, located in the southwest side West Elsdon neighborhood, has been running Conservation Corps programs since 2006. Erin Niedt, who teaches at Hancock, says her students get a sense of pride from seeing the impact of their actions. This year her class handed out dozens of weatherization kits and spent Saturday mornings cleaning up Ottawa Trail Woods. There are no shortage of ways to pursue a “green” lifestyle, and environmental education initiatives, like Chicago&apos;s Mighty Acorns program, are going strong in Chicago even after the city dissolved its environment department into other city agencies. But many have criticized the comparatively small-bore progress of personal action in light of the daunting task of transitioning to a sustainable industrial society before the impacts of climate change become too great. True, shorter showers and recycled goods won’t supplant our fossil fuel dependency, but education builds momentum for grassroots actions that can have far-reaching effects. Pratt, who grew up in the West Lawn neighborhood, says she’s living proof of the lifelong impact of an early introduction to environmentalism. A graduate of the Career Ladder for Youth program run by the Chicago Zoological Society and the Brookfield Zoo, she went on to earn a degree in zoology from Michigan State University. Though the science itself was interesting, she says her favorite part was sharing what she learned.